Art for Hospitality. Wholesale Artwork Suppliers for Hotels, Offices and Bars. Let Direct Art help you provide art for your hotel, bar or hospitality venue. Interior Design Art Suppliers & Consultants. 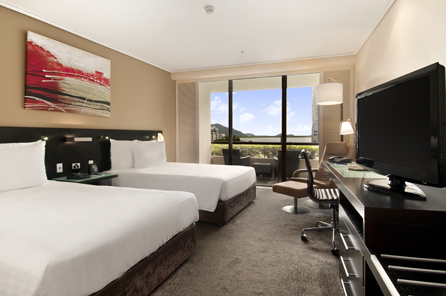 Direct Art has furnished some of Austarlia's most prestiguous hotels including the Cairns Hilton $6 million - award winning refurbishment (Above) and Perth Four Points Sheraton Hotel 280 room refubishment. Direct Art supplied all room art plus restaurant, lobby and bar artwork. You want your hotel to stand out but can't seem to find the right décor to do the job. You've spent time and effort in making sure that the lobbies, business centres, restaurants, and pool areas are designed and decorated to make a guest feel right at home, but is this really enough? If you want to spice up your hotel and turn it into a haven of hospitality and warmth, you can put up beautiful oil canvas paintings and famous paintings of famous artists on the walls. There's a lot to choose from when buying hospitality wall décor, and Direct Art Australi offers its magnificent collection to suit your hospitality art needs. Hospitality artwork should be able to set the mood and establish a calming ambiance around the room to make guests feel comfortable and relaxed. For tour groups who are waiting for the rest of the team can walk around and view several artworks like oil canvas paintings to keep them entertained. If you run a hotel and are thinking of putting up hotel wall décor, this is a good idea because you are bound to have hotel guests who are art fanatics and may want to take a look at some of the artworks you got on the walls. Another option to go for when searching for quality hospitality framed art is buying famous reproduced paintings of artworks done by classical painters. Many people are familiar with artists like Monet, Toulouse, and Van Gogh so definitely they will be interested to look at a reproduction of their famous works. The nice thing about this kind of artwork is that it is affordable as compared to searching, hunting down, and bidding on original pieces that cost millions of dollars. We at Direct Art Australia believe that every client deserves the best at affordable prices, which is why we are one of the leading sellers of wholesale artwork on famous paintings and artists. When it comes to art, nothing can restrict creativity even for hospitality framed art. Direct Art Australia is a hospitality framed art manufacturer that sells a wide selection of eye-catching quality artworks that will make any hotel feel comfortable and hospitable like no other. A lot of hotels today lack in originality and uniqueness when it comes to artwork for their walls and rooms, so start making a change and buy either an oil canvas painting or a famous reproduction to hang on your hotel walls today. We offer free shipping for customers located all over Australia, especially in locations like Melbourne, Sydney, Brisbane, Perth, and Adelaide.